Although continuous level measurement technologies have the ability to quantify applications for bulk solids, slurries, and granular materials, this article will focus on level measurement technologies applied to liquid level measurement utilized in process control. A distinction should be made between continuous level measurement and point level measurement. Point level measurement acts like a switch, changing state when a single level condition is achieved. Called “transmitters,” continuous liquid level measurement devices employ technologies ranging from hydrostatics to magnetostriction, providing uninterrupted signals that indicate the level of liquid in a vessel, tank, or other container. Hydrostatic devices focus on the equilibrium of dynamic and static liquids. There are three main types of hydrostatic transmitters: 1) displacer, 2) bubbler, and 3) differential pressure. The displacer transmitters utilize a float placed within the liquid container. With its buoyancy characterized to the liquid and the application, the float, a connecting stem, and a range spring or similar counterbalance represents the liquid level in terms of the movement of the displacer (float). The displacement, or movement, of the assembly is converted into an electric signal for use by the monitoring and control system. Bubbler transmitters are used for processing vessels that operate at atmospheric pressure. This method introduces a purge gas or an inert gas, e.g. air or dry nitrogen, into a tube extending into the liquid vessel. Precise measurement of the pressure exerted on the gas in the dip tube by the liquid in the tank is used to determine the height of the liquid. Differential pressure (DP) transmitters rely directly on, in a basic explanation, the pressure difference between the bottom and top of the container. 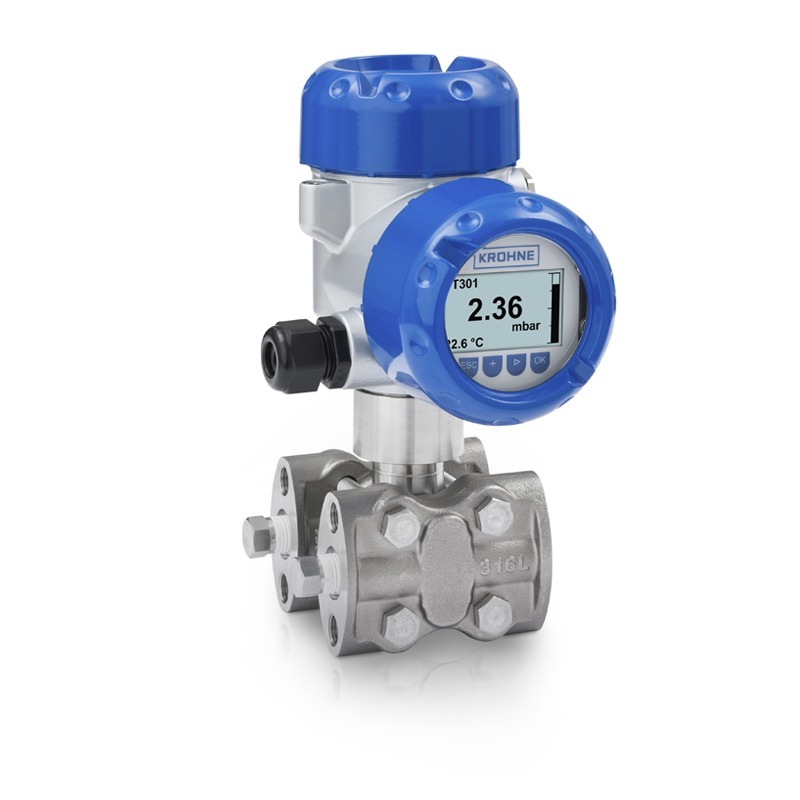 Precise pressure measurement is used to determine the height of the liquid in the tank. One of the most advantageous aspects of DP transmitters is that they can be used in pressurized containers. Other examples of level transmitter technologies which are not hydrostatic devices include magnetostrictive, capacitance, ultrasonic, laser, and radar. In magnetostrictive level transmitters the measuring device, a float, has a magnet that creates a magnetic field around a wire enclosed in a tube. Electrical pulses sent down the wire by the transmitter head produce a torsional wave related to the position of the float, which moves with changes in liquid surface level. The transit time of the torsion wave back to the sensing head is measured and the depth of the liquid, as indicated by the float position, can be determined. Capacitance transmitters are best applied to liquids that have high dielectric constants. Essentially, changes in the capacitance of the sensor / tank / liquid assembly will vary proportionately with the liquid level. The change in capacitance is measured and converted to an appropriate electrical signal. Ultrasonic level transmitters emit ultrasonic energy from the top of the vessel toward the liquid. The emissions are reflected by the liquid surface and them time required for the signal to return to the source is used to determine the distance to the liquid surface. Laser level transmitters operate similarly to an ultrasonic level transmitter. However, instead of using ultrasound signals, they use pulses of light. Radar level transmitters involve microwaves emitting downward from the top of the container to the liquid’s surface. The measured time for receipt of a return sign reflecting off the liquid surface enables calculation of the distance from the sensor to the liquid surface. The precise measurement of transmit time for a wave or pulse of energy is employed in several of the technologies, the measurement of pressure in others. Each technology has a set of attributes making it an advantageous selection for a particular range of applications. Various manufacturers offer modified or enhanced versions of the basic measurement technologies to provide performance or cost benefits for ranges of applications. Share your liquid level measurement challenges with an application expert, combining you process knowledge with their product application expertise to develop effective solutions.